Calcium phosphate (CaP) materials have been used for decades in medical devices that interface with bone. Porous CaPs can serve as fillers in bony defects caused by cancer, congenital defects, or traumatic injuries. Some of these defects result in severe disfigurement and loss of function. The most severe, those that are complex and/or critical size defects, do not heal with current treatments of allograft, autograft, or synthetic graft. Our interest is specifically in the role of microporosity (<50 microns), or microstructure, in stimulating and controlling bone growth in CaP bone scaffolds with porosity at multiple length scales. Previous work has shown that microporosity enhances bone growth in vivo though the specific mechanism(s) have been elusive. We propose a specific mechanism as the driving force for the enhanced bone regeneration. Capillary forces generated by the microporous network deform cells and draw them into the pores, effectively self-seeding the scaffolds and trapping the cells. We propose that this occurs at implantation and provides the initial conditions in the defect microenvironment that enhance regeneration. I will describe our recent in vitro and in vivo experiments supporting this hypothesis. We have found that penetration is cell-type dependent due to variations in cell size and stiffness, and that we can manipulate penetration depth. The work suggests that the microporous network could be optimized to self-load heterogeneous cell populations to further enhance regeneration and to add another dimension of control in drug delivery. I will also briefly introduce other work in my lab relating to cell-cell and cell-material interactions and to mechanics of soft tissue for applications in pre-term birth. Professor Wagoner Johnson is an Associate Professor in the Department of Mechanical Science and Engineering (MechSE) at the University of Illinois. She received her BS in Materials Science and Engineering from The Ohio State University in 1996, and MS and PhD in Engineering from Brown University in 1998 and 2002, respectively. From 2001-2005 she was research faculty at the University of Illinois. She joined as an Assistant Professor in 2005 and became an Associate Professor in 2012. 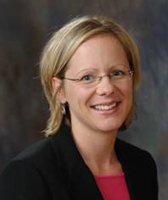 She is currently a part-time faculty member of the Beckman Institute for Advanced Science and Technology, and has affiliations with the Institute for Genomic Biology, the Department of Bioengineering, and holds a Visiting Professor appointment in the Department of Mechanical Engineering and Materials Science at Washington University in St. Louis.